This Catering Stand Pipe / Strainer Plug provides practical management of waste and water. Prevents solid waste from entering drains and the stand pipe is removable to empty water from the commercial sink. 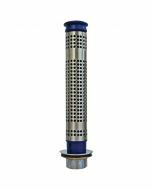 This unit is the standard combined sink waste standpipe/strainer for commercial kitchens, manufactured from a durable stainless steel and polyamide with a blue top. Designed to fit all UK manufactured commercial and catering sinks.